First Penance, Religious Ed. 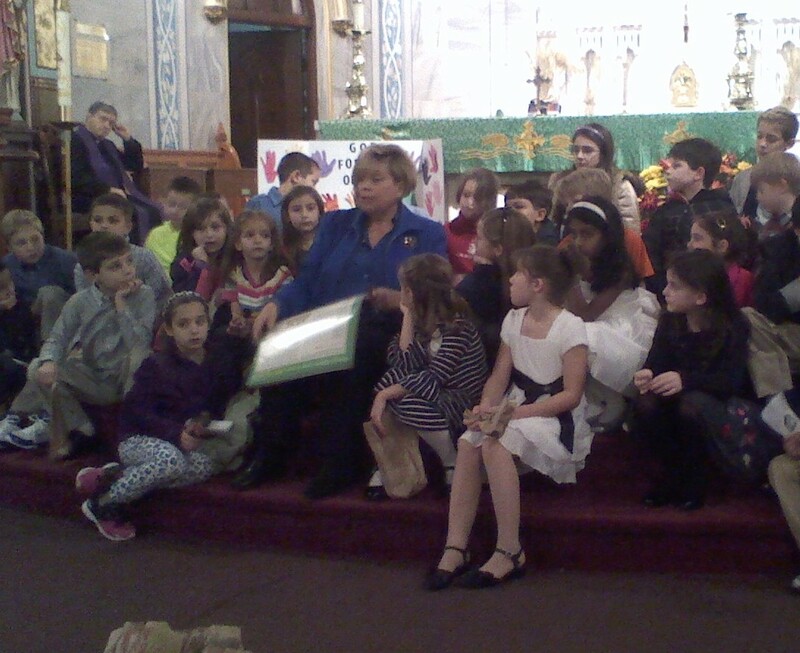 and many other parish programs supported by annual "Recommitment Appeal"
Mrs. Pat Heller (right), Director of Religious Education, reads the story of "The Little Lost Sheep" to 28 children gathered around her on the steps in front of the altar, preparing them to make their First Penance on Tues., Nov.19. A second group of students celebrated this sacrament for the first time the following night. Religious education and sacramental classes are just some of the scores of programs and activities at St. Joseph Parish made possible by parishioners' generous Offertory contributions. RECOMMITMENT SUNDAY, taking place on Nov. 23-24, invites all registered parishioners to prayerfully decide what share of their income that they will commit to give back to the Lord over the course of the next 12 months. Contributions may be made by weekly Offertory envelopes or by convenient Online Giving. "Recommitment envelopes" were mailed to the homes of all registered, active parishioners. If you did not receive one, you will find extra "recommitment envelopes" in the rear of the church. Or just contact the Parish Office at stjoseph.rectory@sbcglobal.net. For more information or assistance on any of these options, please call Ginny Harger or Sheila Marcinauskis at the Parish Office (203-924-8611). Use "Online Giving" for convenient, secure weekly, biweekly or monthly contributions charged to your credit card or checking account.